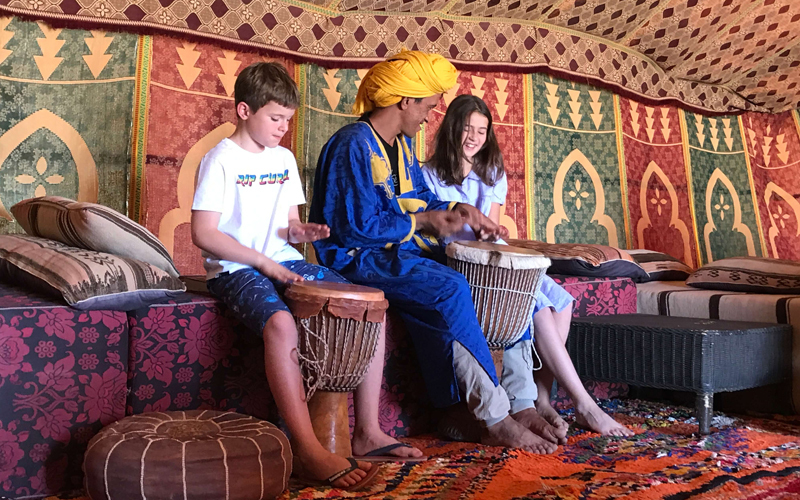 For those who haven’t yet ventured to Morocco with the kids, our in-depth family guide to exploring this truly beguiling country will fire your imagination. 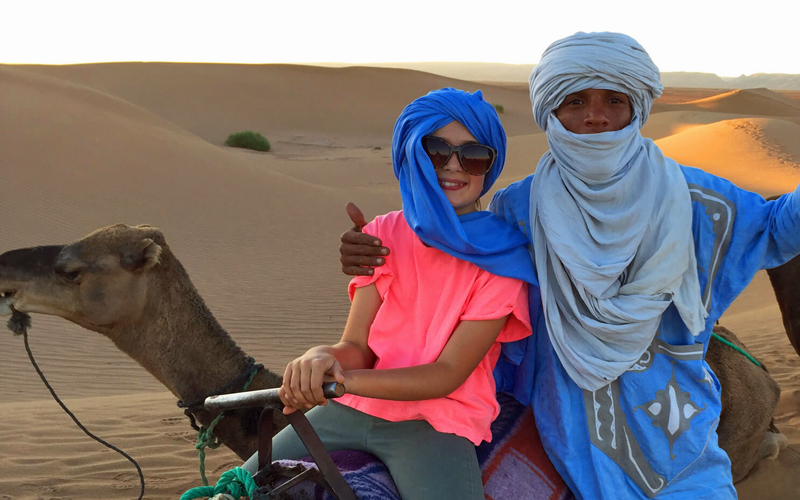 What does Morocco offer kids? Moroccans love kids, and your children will be appreciated wherever they go. The country has a dazzling array of diverse destinations for kids to explore: Historic walled cities, surfing shores, shimmering sands and mighty mountains – each with its own history and traditions. If it’s too hot in the cities during the summer, head to the cooler coasts or ascend into the hills. 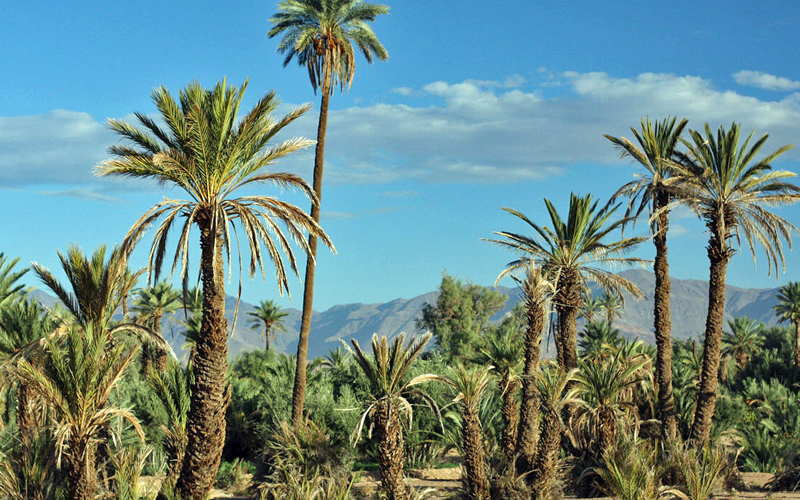 Discover film sets and venerable kasbahs in the desert regions. Shop for artisanal products until you drop. Introduce your children to traditional spa rituals. Turn your gaze heavenwards for fabulous night skies. Get to appreciate a little of the Berber culture. Undertake thrilling 4WD rides in the dunes. Enjoy a memorably alternative Christmas in winter sunshine. When should you visit Morocco? Morocco appeals most to European families in the shoulder seasons and winter months because of all that lovely sunshine. You also get to see a vibrant culture, distinctly different from Europe yet still accessible for children, with colourful cities, bustling souks, farm animals roaming about and ancient customs still very much a part of everyday life. There are plenty of European flights in and out of Marrakech and Agadir, with more limited services to and from Essaouira on the Atlantic coast. Expect journey times to be 3hr30-40m from London, Manchester and Paris, about 4 hours from Berlin. The country is a relatively safe place to travel, particularly to the main tourist hotspots, though visitors should be always vigilant. Check the latest travel advice here. As a rule of thumb allow about 3 hours by road between Marrakech, Essaouira and Agadir. You can also fly between these three cities (and to Ouarzazate), but many prefer to take a road transfer to see more of the country. From Marrakech into the Atlas Mountains it’s an hour, you could see the Atlas on a day trip. From Marrakech to Ouarzazate is about 4-6 hours by road depending on your route and whether you sightsee on the way. 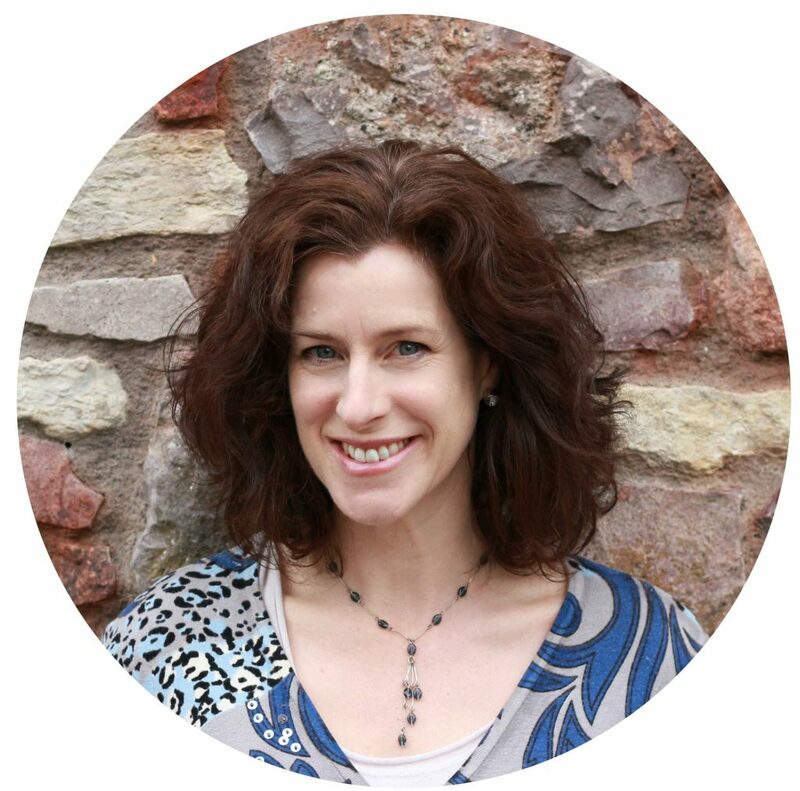 A two-destination trip demonstrating cultural and geographical contrasts is easy to arrange. 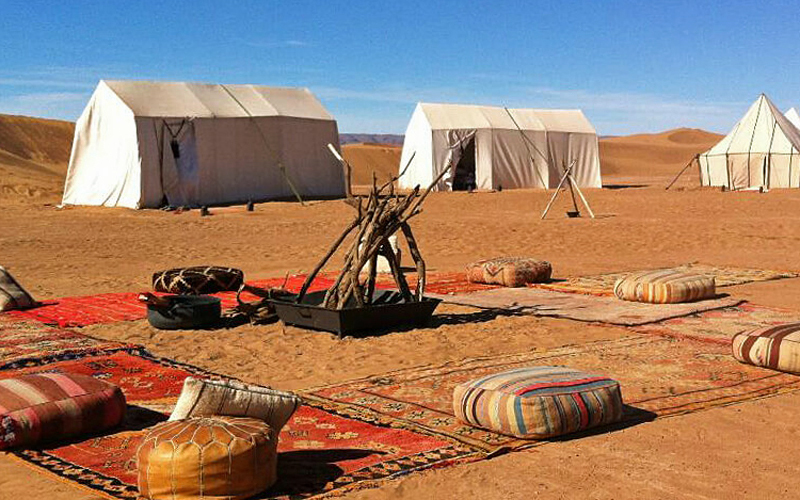 If you have an ambitious itinerary or want peace of mind, we advise working with our Moroccan Tailormade Tour Operator who can create bespoke trips for you and your family. The famous Red City is most people’s first Moroccan encounter. 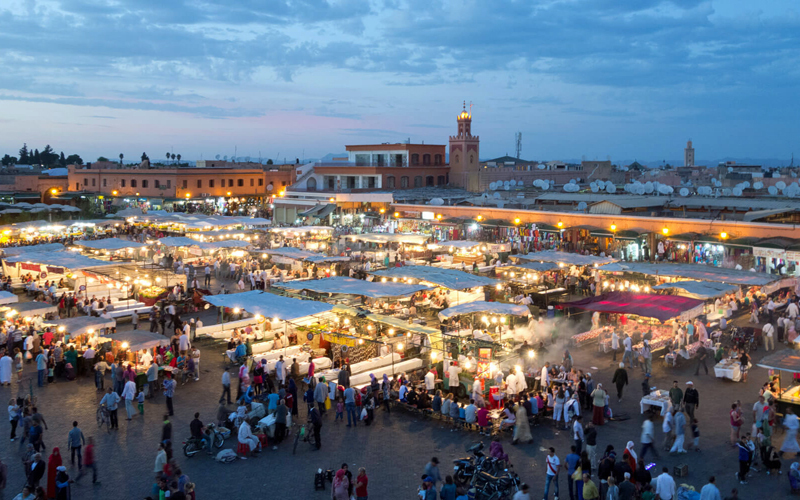 In a semi-arid plain of palm oases near the foothills of the Atlas, Marrakech has ancient city walls, a historic medina with enchanting souks and its incredible central square Djemaa el Fna where you can watch snake-charmers and musicians, and feast on sheep’s heads. Kids will be entranced by the metal craftsmen, weavers, dyers, glass-blowers, leather-workers and cobblers in the markets. There’s something for every age to covet from babouches (slippers) to replica sports kits to spice blends, and, if they can handle the smell, the tanneries are an extraordinary assault on the senses. 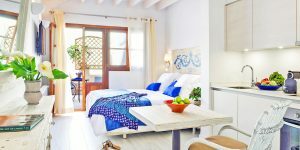 For a respite from the busy souks (note: you are expected to haggle), head to Yves Saint Laurent’s Majorelle Gardens which are an oasis of cool and calm. Be shown around the city in a caleche (small horse-drawn carriage). For those wanting to be close to the excitements of the Medina, Riyad el Cadi will fit the bill. A home away from home, this elegant riad is spread over 7 interconnecting houses, has larger suites and a plunge pool, and is 10 minutes from the Djemaa el Fna. And under 12s stay for free. Or, relax 10km outside the bustle in the lush oasis that is Fawakay Villas, a complex of family-friendly villas and suites set around a swimming pool, hammam, arts & crafts shack, family pets and clay tennis court. 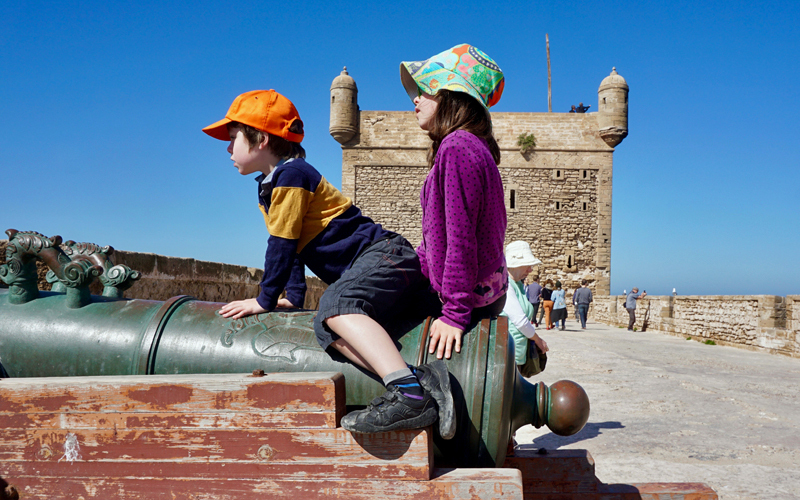 Increasingly popular, 18th-century fortified coastal town Essaouira is where kids can clamber all over the brass cannons on the original sea walls. Here the souks are small and very friendly, haggling isn’t the norm as in Marrakech. A great attraction is the fish market where you can see fishermen land their catch and sell straight off the boat. The flat shallow beaches comprising Plage Tagharte are a draw for families too, and there are any number of operators selling wind-related activities. 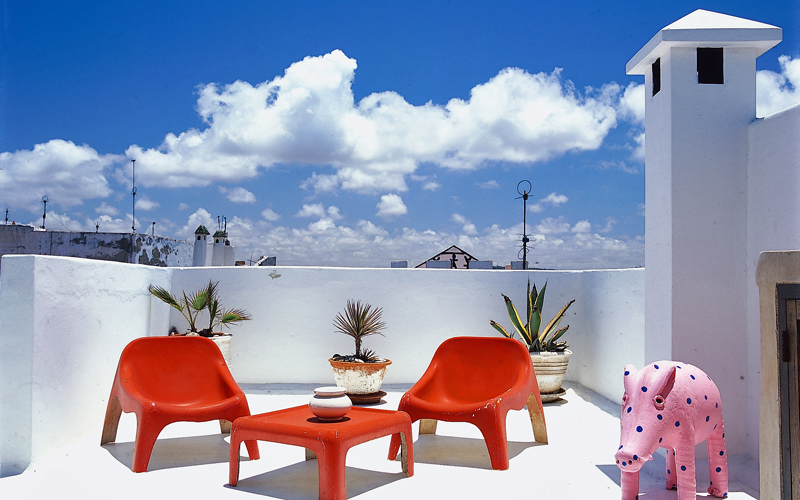 If you’d like to live like a local in this charming town, we suggest beautifully retro-inspired 4-storey home, The Design House, in the heart of the Medina. You get 2 terraces, 4 bedrooms, toys and board games, and the house is only 10 minutes from the beach. 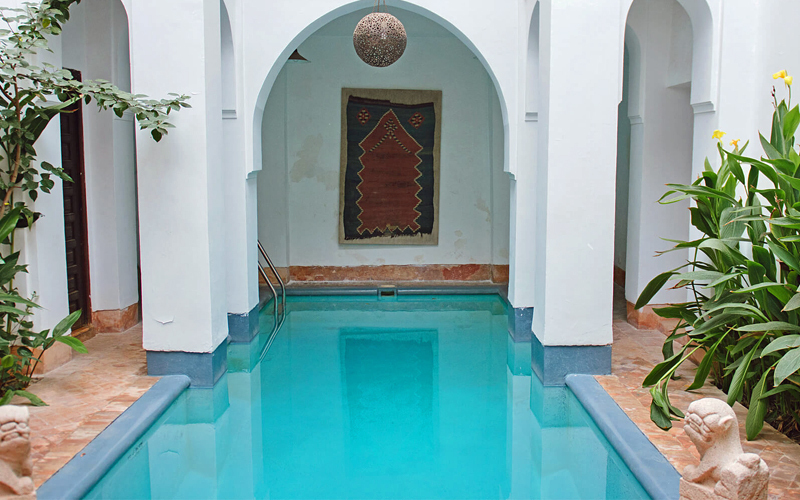 Or cocoon yourselves in stylish sheltered haven Le Jardin de Douars, only 15 minutes outside Essaouira, which comes with fabulous botanical gardens, heated swimming pools, boules and colourful Moroccan suites. This long sandy coastline provides respite from the heat with its year-round winds (and is chillier in the winter consequently), and offers amazing surfing, windsurfing, land-yachting and parasailing, and attracts aficionados from all over. 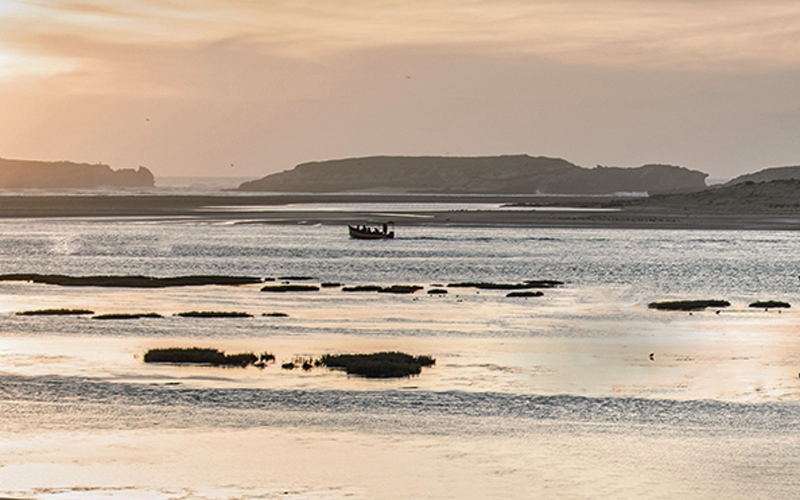 Head 3 hours north from Essaouira (or Marrakech) to reach Oualidia, a delightful small fishing town around a crescent-shaped tidal lagoon and golden sand, sheltered by a rocky breakwater. You get ample birdlife, beautiful views and great fish restaurants featuring the local specialty, oysters. Alternatively, travel 2.5 hours southwards along the wild rugged Surf Coast. Metronomic Atlantic breakers have led to a big surfing industry, you’ll spot many a tanned dreadlocked dude worshipping the waves. 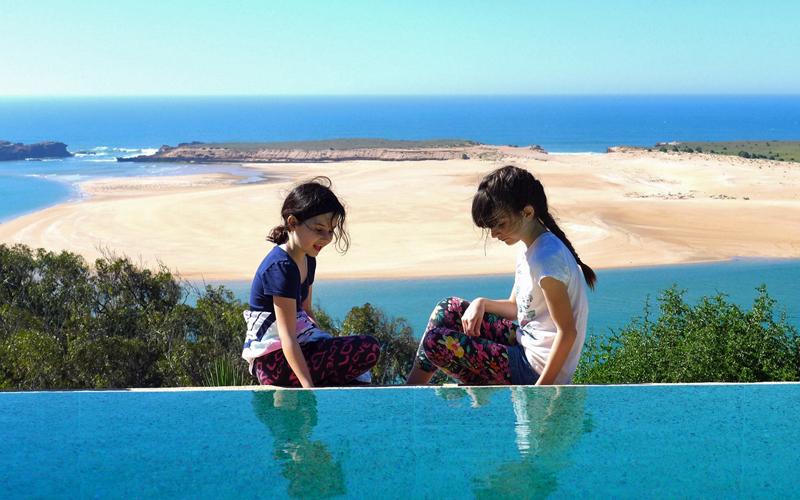 In Oualidia, peaceful cliffside retreat Villa La Diouana is a well-provisioned 4-bedroom villa with knockout lagoon and ocean views, infinity pool, ping pong, playground, games and zipwire. Near Taghazout (and only an hour from Agadir), Paradis Plage Resort is that rare hotel which works for everyone. There’s a top-notch spa, an inspirational beach yoga shala, a kids club, kids pool, ping-pong and playground, good grub across 3 eateries, and that gorgeous shining beach. All rooms come with a sea view. Plus, the surf shack has excellent instructors and equipment to hire. Running SW-NE, the majestic snow-capped peaks of the awesome Atlas Mountains form the northern boundary of the Sahara Desert, and make an easy side trip south from Marrakech. 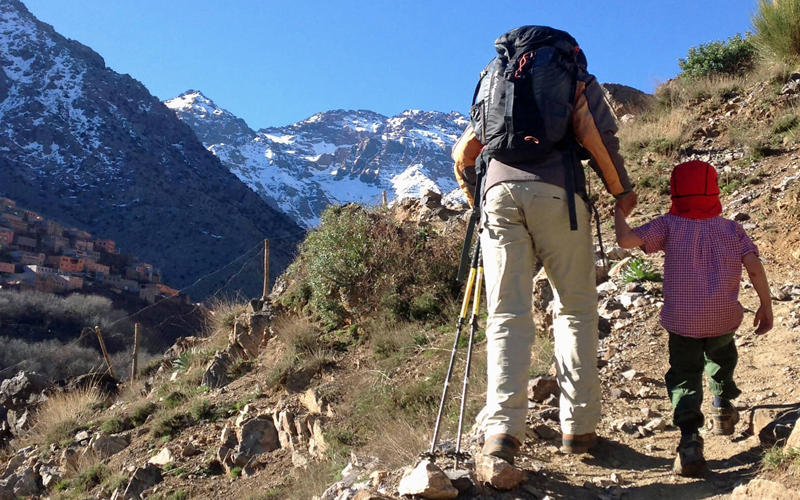 Head due south to trek the slopes of Toubkal, the highest point in the Arab world (over 4,000m), from its mountain tourism hub, Imlil, or head south-west for the attractive Ourika Valley with its waterfalls. Visit a Berber home for lunch, or stay overnight in a local village. Kids like the novelty of trekking with a mule, there’s camel- and horse-riding nearby. 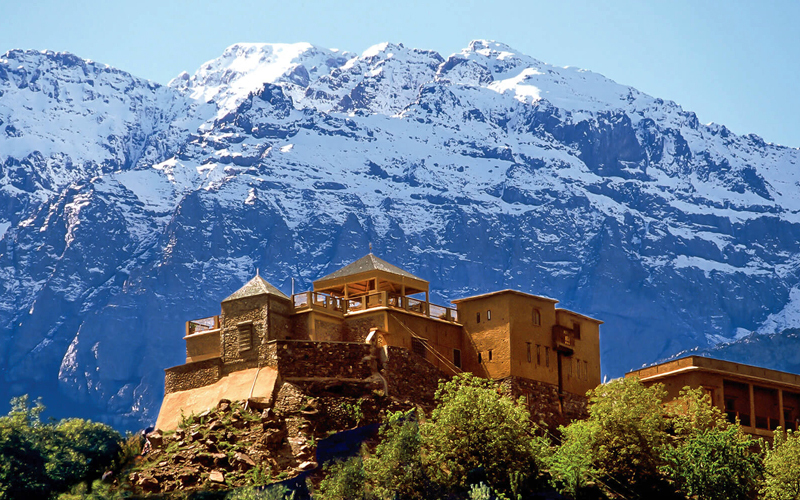 By universal acclaim, the best place for both trekking and gaining an insight into the Berber way of life is to stay at Kasbah du Toubkal. Accommodation comes in a range of options, there are trekking packages for families, you get to visit the local villages, and you can meet the mules! Southwards from the Atlas Mountains, the landscape shifts from dramatic slopes and lush carved-out valleys fed by rainwater runoff to semi-arid desert. You’ll see extensive palmeries and the characteristic kasbah-hamlets (ksour), the most famous of which, Ait Benhaddou, has been featured in many movies, including The Sheltering Sky. Near the regional hub Ouarzazate, the picturesque Dades Valley has been dubbed the ‘Valley of a Thousand Kasbahs’, further south is the long (and sometimes seasonal) Draa River, which you’ll cross to reach the incomparable rocky ranges and sand dunes of the Sahara itself. 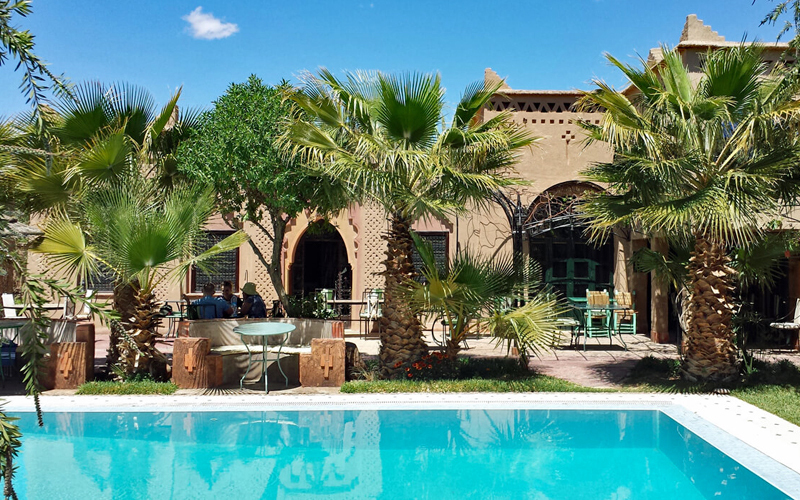 Near Ouarzazate and the Dades Valley, on a working farm, is welcoming guesthouse Sawadi, set amongst ancient palm groves. Rooms are spread across 6 small Berber-style kasbahs, there’s a gleaming pool, bikes to hire, and flowering gardens plus a huge vegetable patch. Perfect holidays for pre-schoolers and their parents How to get the most out of a multi-generational family holiday 8 great family hotels to book now for 2019!